This past Saturday I worked a public service event with my club, Anne Arundel Radio Club, in conjunction with Calvert Amateur Radio Association. The event was a Cystic Fibrosis Foundation Cycle for Life bike event, and this particular one in Calvert County was a first time event. We were first informed of the event about 2 weeks in advance, so we had very little time to go from nothing to up and running. Luckily, we had a number of experienced volunteers so it went very well. The event had 3 routes for participants, ranging from a 27 mile loop to a 60 mile loop, so there was a lot of area to cover. Despite the availability of a 2 meter repeater on a tower smack in the middle of the event, we opted to run a simplex net. It’s always good practice to run on simplex, and people often forget how effective and clean this is. Plus, it can make it a lot more fun! As you can see, the topography and size of the course gave us a good challenge to work simplex. There is nearly 200 feet of elevation variation across the course, and over 12 miles from Net Control to the furthest point on the course. Despite all of this, we had great success sending and receiving message traffic across the course. In fact, the only fixed station on the course that couldn’t reach Net Control was Rest Stop 2 (the most westerly stop on the course), given that both Net Control and Rest Stop 2 were only a few feet above sea level with a large elevation increase between them. Luckily, Rest Stop 3 was able to relay information between Net Control and Rest Stop 2 without issue - great practice of this technique in a low-risk environment. At Net Control we had a 35’ mast, provided by N3USP, which made a huge difference in our ability to cover the course. The mast is made from a series of interlocking pipes, with a tripod attached at the base and anchored with stakes attached to the legs and guy wires from the top. 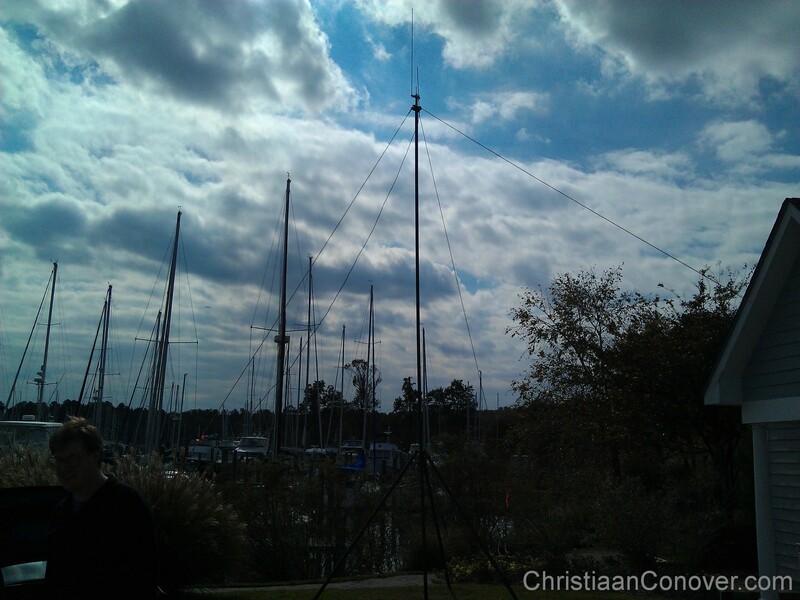 A J Pole antenna sits at the top of the mast. Since this was the first year of this particular event, there were only 60 or so riders, which meant there was a relatively small amount of information being passed. Because of this, we were able to easily shift operators and procedures on the fly without much impact on our ability to pass information, and fine tune our technique for future events. That said, very little modification needed to be made during the event since we had done lots of prior planning. We mapped the entire course and placed stations in accordance with information received from the event coordinator and local knowledge of the hams in the area. We maintained a roster of volunteer operators so that everyone knew their station and what would be needed for that location. We held a net the night before to hammer out any concerns or thoughts volunteers had. Throughout all of this, we kept constant communication with the event organizers so they knew what our plan was and could update us with any new information. With all of this planning in advance, we had very little issue with the event itself. We’re currently putting together our after action report. If you’d like to know more about any of our planning or any other element of this event, please feel free to contact me. Google+ for Apps Accounts is Here!